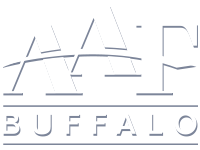 This past Wednesday on October 11th during Ad week, AAF Buffalo held its annual Student Panel for college students at Daemen College. While midterms may have kept most students locked away in the library, the panelists got the chance to have a round table bad-and-forth discussion with two great students from University of Buffalo. The talk touched on a plethora of topics ranging from the ins-and-outs advertising agencies, directions to go in as a designer, and what it’s like to work in the business world of marketing. Finding out your own path as a student can be very hard. You hear about all these cool ad campaigns, brand identity projects, web development jobs, and are inspired to continue your schooling and keep working, but then you think, wait, what do I want to do? For one of the attendees, who is currently a freshman, this was the problem. To help answer that question the panelists talked about their career path, which inevitably lead to a multitude of side discussions. In these side discussions the panelists explained the industry, their individual job roles, and what they see as valuable characteristics going forward in the industry. Discussing things back-and-forth to give developing thoughts a new perspective was a big component of the talk. This may seem beneficial to those who are still searching but what happens when you’ve already defined things for yourself? Even though you’ve worked hard to get your diploma and you have a career path in mind, you still don’t know how to get into the industry or how it even works. These were some of the problems for our other attendee who is currently a senior. The panelists tackled these problems by shedding light on the logistics of the advertising world and gave practical knowledge of how things work on a day-to-day basis. What job titles do what, how an advertising agency is structured, how to network, what the heck an “in-house” is, and how advertising works in general were big topics in this end of the talk. Overall, learning about everything that makes up the back end of the advertising world is a daunting task. One talk can scratch the surface but it only begins the discussion on how many different doors can be opened in the future. So until the Portfolio Seminar in November, keep learning, designing, and keep sticking your foot in as many things as possible (inside joke, you had to be there).